Close your eyes and imagine you are dropped into the middle of your favorite national park. What do you see? What do you hear? If you ask this question of an average visitor to Voyageurs National Park, you might get a variety of responses: “I imagine relaxing in my canoe, watching the sun set over a pristine northern lake.” “I smell walleye cooking over a crackling campfire at my shoreline campsite.” “I hear loon calls echoing across a still, dark lake.” For many visitors, these sights, sounds, and smells define the Voyageurs experience. 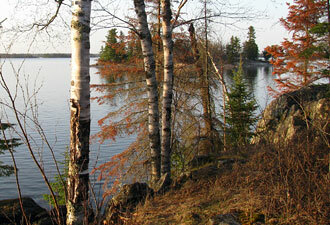 But there are also a hardy few who have learned that idyllic summers are only half of what Voyageurs has to offer. As the sun slowly retreats to the south, a few minutes each day are lost. Eagles, loons, and most everything with wings depart for warmer waters. Black bears feast to bulk up for their winter slumber. The first (and second, and third…) dusting of snow coats the forest floor. A thickening sheen of ice tops the lake surfaces. Winter has arrived. Voyageurs begins anew. What experiences last in the memories of wintertime visitors to Voyaguers National Park? Is it the silence of a gentle snowfall, broken only by the quiet patter of falling snowflakes? Is it the unexpected discovery of wolf prints in the snow along a trail (or the deer prints they follow)? 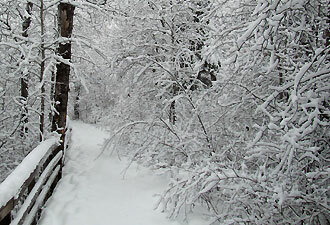 Is it the sound of fresh, unbroken snow crunching under snowshoes? 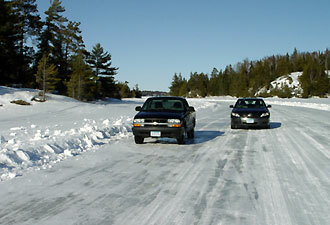 Is it the first few tentative seconds on an ice road after driving off of land? Is it the whoosh of cross-country skis gliding along the Black Bay Ski Trails? Is it the warm cup of hot chocolate after a numbing snowmobile ride to the Rainy Lake Visitor Center? All these experiences can be yours during a winter visit to Voyageurs. The Rainy Lake Visitor Center is open year-round and has free snowshoes available to borrow. Cross-country skis, boots, and poles are also available for checkout and are free for children under 16 years old. Or bring your own skis, snowshoes, snowmobile, or ice fishing equipment and set out from your favorite spot on the Rainy Lake Ice Road. Just like a summertime visit, a winter journey to Voyageurs has endless possibilities. Of course, as days grow longer, birds soon arrive from their winter retreats. Black bears awaken as snow melts and the frozen lakes revert to water. The sun returns north, and so do visitors; 85-90 percent of Voyageurs’ annual visitation occurs during the months from May through September. Memories will be created every day, whether from watching a bald eagle dive for fish, listening to the howl of a wolf pack from a forested campsite, or napping or relaxing with a book in a hammock along the lakeshore. As winter returns again, you don’t need to sit idly by the fireplace with only memories of summertime. Come experience a winter in Voyageurs National Park and discover everything else the park has to offer.